The Batwa have been a Member of the UNPO since 17 January 1993, initially represented by the Association for the Promotion of Batwa (APB), which later merged into the Community of Indigenous Peoples of Rwanda (CAURWA). At the request of APB, UNPO sent a mission to Rwanda and neighbouring countries, Democratic Republic of the Congo (DRC), Tanzania and Burundi in 1994. UNPO staff members also went on fact-finding missions in Rwanda in 2010, 2016 and again in 2018. The current organisation representing the Batwa within UNPO is the Cultural Conservation Act (CCA), but UNPO collaborates with several other organisations on the ground. The Batwa, also known as the Twa or the Pygmies of Central Africa, are an indigenous group and the oldest recorded inhabitants of the Great Lakes Region in Central Africa. Their name Batwa derives from “twa”, a term in the Bantu languages of Sub-Saharan Africa to describe people who are primarily hunter-gatherers or former hunter-gatherers and the original inhabitants of the area they reside in. The word Mutwa is used to describe a single person, while Batwa refers a group. Originally the Batwa inhabited the region around the mountainous forests of Lake Kivu and Lake Edward. The creation of national parks and economic development from the 1970s onward led to the displacement of part of the community and forced them to live as squatters in various rural areas (Ashdown, 2013). In Rwanda the Batwa are dispersed over an area of approximately 100,000 square kilometres in small communities, usually at the periphery of mixed communes. The estimated population of the Batwa in Rwanda and surrounding countries is between 86,000 and 112,000. 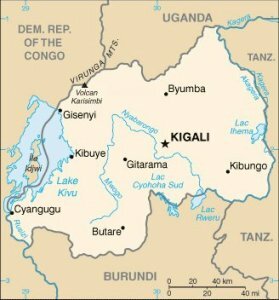 In Rwanda they are smallest of the three ethnic groups, comprising of less than 0.4% of the population. The Hutu and Tutsi comprise 85% and 14%, respectively. After the Batwa were driven out of their forests and could not continue their practices of hunting and gathering they turned to pottery, which quickly became part of their identity. The Batwa who are not potters work as day laborers, small-scale cultivators, beggars or fishers. Due to their low social status, the Batwa have limited access to education and they have a higher illiteracy rate than the rest of the population. The Batwa have consistently been displaced from their land, leaving most homeless. However recently the hopes of ancestral lands being returned to the Batwa have sparked again as international and regional bodies such as the African Commission on Human and Peoples' Rights have recognised the injustices committed against the Batwa and called upon Rwanda to recognise the Batwa's rights and allow them access to their cultural land. The UNPO hopes that this recognition will be beneficial to Rwanda's Batwa but most efforts done in their favour do not lead to a positive outcome given the government's refusal to recognise them as a distinct ethnic and cultural group, in the name of a non-tribal Rwanda and the maintenance of societal harmony. This situation makes it difficult and nearly impossible for Batwa to organise in Batwa-focussed associations, for example. This also explains why groups that have worked for Batwa rights have consistently been met with government-created semantic barriers. This situation is unlikely to change given that on 12 July 2011, the Rwandan government once again reaffirmed the position that recognition of the Batwa goes against the constitution, threatening to revoke all NGO assistance unless the Batwa's campaign for recognition is terminated. But while the Batwa can be legally erased, society is far less malleable and State-sponsored discrimination poses a challenge to the Batwa, who are ignored as the government fails to recognise their need for development, services, primary healthcare and better infrastructure. Reports released by UNPO and the African Initiative for Mankind Progress Organization (AIMPO) also highlight the difficulties faced by marginalised groups within the Batwa population, such as Batwa with disabilities or Twa women. The UNPO considers the successive land policies of Rwanda which have left the Batwa population landless, homeless and destitute to be a breach of human rights. Proper compensation should be provided to those who have lost their land and homes and Batwa refugees who have returned following the 1994 genocide should be granted equal status and access to ownership as other Rwandans. The UNPO supports Batwa efforts for recognition as a distinct ethnic group believing that this will open the door for developments in targeted support for the Batwa community, from international organisations, Rwandan civil society and the Rwandan government. In order to further those ends the UNPO submitted an alternative report to the UN Committee on the Elimination of Racial Discrimination ahead of Rwanda's examination in March 2011. The fact that the UNPO’s report was the only NGO report submitted to the treaty body monitoring committee underlines the severe marginalisation the Batwa face from economic, social and political opportunities in the country. In February 2016, the UNPO also submitted a paper to the Human Rights Council’s Expert Mechanism on the Rights of Indigenous Peoples highlighting the way the laws of Rwanda make difficult the realisation of the rights of the Batwa. In January 2017, the UNPO submitted a report in advance of the 66th Session of the Convention for the Elimination of all forms of Discrimination Against Women highlighting the double discrimination Batwa women face in Rwandan society. The Batwa, represented at the UNPO through the CCA, aim to have their basic needs met as well as to have their human rights respected. They do not aspire to any kind of political independence but rather strive to pursue their traditional livelihood within Rwanda. Since they cannot return to the forests and most of their housing has been destroyed, they struggle for land rights to be able to sustain themselves. They also wish to have their rights respected through their recognition as an indigenous population of the Great Lakes Region. 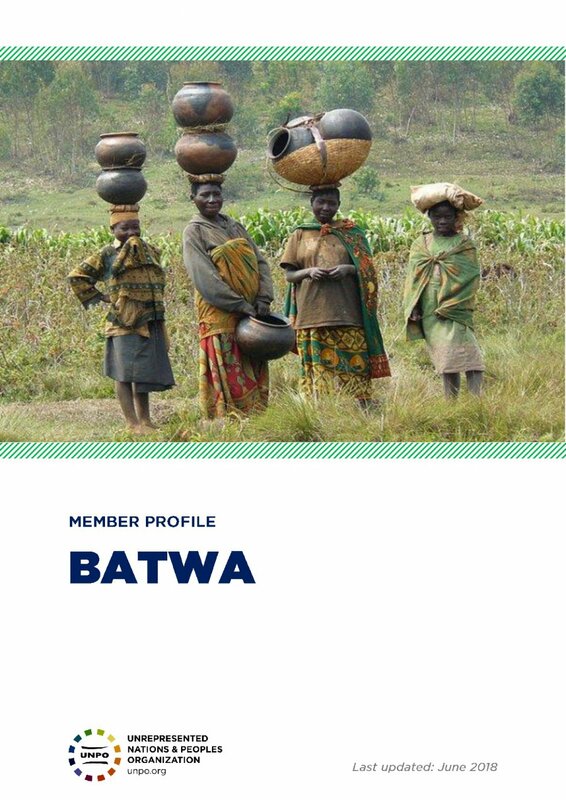 Please download our Batwa Member Profile Brochure.